I've mentioned before here, that I'm going to post a series of sketch post at least once a month but pardon my laziness and procrastination that I couldn't make it for January teehee. So here is the sketch for this month, a sketch of Hogwarts School of Witchcraft and Wizardry. 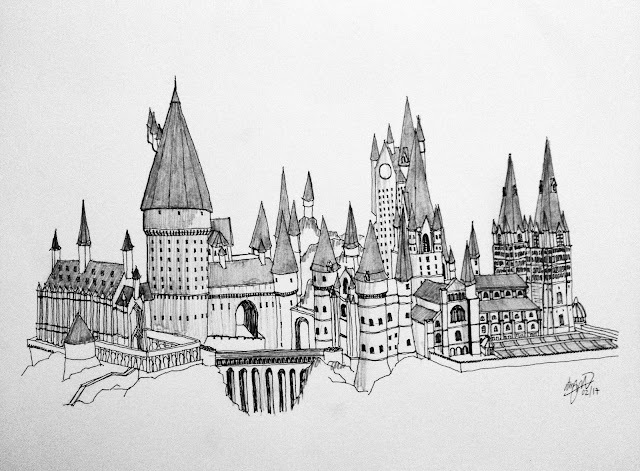 If you read my 'About' section, you'll know that I'm a fan of Harry Potter (HP) and any HP fan would love Hogwarts. I had the idea to draw Hogwarts since forever but was afraid it will not turn out as good as I imagined since the school setting is huge. I thought I wouldn't dare to take the risk of getting my drawing ruined and tore up countless paper of efforts but I glad I did it anyway. This final masterpiece is actually my third attempt, hope it turns out well enough to your eyes (it's embarrassing to call this drawing as a 'masterpiece' myself but bear with me hiks). its pretty! wish I have your talent. sob sob. but I'm sure that you practise a lot before you reach this level. First of all. Thanks a lot for dropping by at my humble space. Really appreciate it! Anyway, I'm a fan of HP too. Nice sketches you got there. I have followed your blog and of course expecting to see more awesome sketches from you in the future. Actually it's a shame that I just stumbled upon your site as it's really awesome, I should have find you sooner! Uh oh I suddenly felt burdened now that you're expecting more of this kind of sketches haha. Thank you for the compliment Siqah! I will! yup, this masterpiece is indeed my darling hogwarts. you're so good! I've seen the prototype ( prototype ke org pggl ) hogwarts building way back in UK. Your drawing It quite exactly the same dear. Well done !!! Bestnya pandai melukis . You have a great talent .